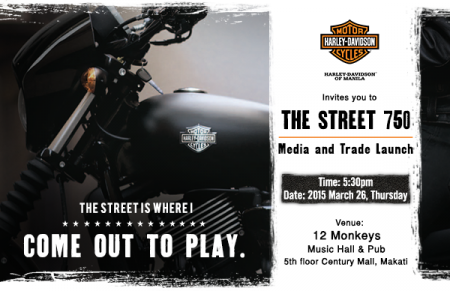 Harley-Davidson® of Manila launches the STREET 750, the ultimate street riding machine designed for the new generation of global riders and built for the urban environment, to both Media and Trade. The unveiling was presented by Sam Pinto followed by the recognition of the first two buyers of the Street 750. The new members of the H.O.G.® group were also inducted, it was held last Mar 26, 2015 at the 12 Monkeys. The new Harley-Davidson®Street 750 is real steel, authentic Harley-Davidson®motorcycles that amplify how you, as an individual, make your mark and forge your own way. They deliver what is demanded in urban environments: all new, Revolution X™ powertrains, nimble agility, and the sound and look that lets everyone know they are genuine Harley-Davidson. Sam Pinto as Celebrity Presenter.